Y' say y' want a Revolution? At first, I’d supposed that this government shutdown would last only about a week. But, as I begin to get a sense of the animosity that’s motivating both political parties, I’m starting to wonder if this battle might last several weeks. This isn’t just politics anymore. This is ego. Some of these politicians won’t agree to anything, no matter what. They are going to hold their breath, until you turn blue. We’ll see how long these egos can dominate. We’ll see how long before a compromise of some sort finally seems reasonable or at least unavoidable. After a few days of “shutdown,” I began to realize that the Obamacare/Government-shutdown problem was more serious than I’d first supposed. I began to sense that this “problem” had a reality that went much deeper than the usual “made for TV movies” that Congress likes to produce—but I didn’t understand Why this problem was unusually serious. Bunk. No one in Washington is an “anti-government ideologue”. Everyone in Washington believes in some “government”. But the Tea Party members of the Republican Party are “anti-big-government ideologues” (praise the LORD). In fact, some Republicans are actually starting to behave like Republicans rather than “RINOs,” “Republicrats” or the “Democrat auxiliary”. Some Republicans are actually standing up for limited government. • We know that our Constitution was intended to create “limited government”—but what does the term “limited” really mean? What are the “limits” in “limited government”? As government grows, it’s clearly moving away from “limited government” and towards “unlimited government”. That necessarily implies that if we’re moving away from government “limited by law” towards an “unlimited government,” that brave-new-government will be “unlimited by law”—and therefore lawless. Thus, “unlimited government” is, by definition, lawless government. It follows that “big” government is necessarily more “lawless” than “limited” government. We don’t have “unlimited government” today. However, we are clearly moving away from “limited government” and towards “big” and “unlimited government”. We are therefore coming closer and closer to lawless government—government that’s run as a criminal enterprise rather than as a service to the people. Isn’t that exactly what you’re already seeing? Isn’t big and bigger government also increasingly lawless and therefore dictatorial? • OK—if “limited government” is necessarily limited by law—whose law will impose those limits? It doesn’t make sense that the “limits” in “limited government” would be imposed by the government itself. If the government could set its own “limits,” there’d be no legal “limits”. Congress and government could do whatever they wanted, whenever they wanted. Instead of “limited government,” we’d have “unlimited”—and therefore lawless--government. So, if there’s going to be a “limited government,” the laws that limit that government must be imposed by a power and sovereignty greater than that of the government, itself. There are two possible sovereigns greater than government: 1) God; and 2) the People. God’s law (as found in the Bible) should govern His creations—including the American people. The People’s Law (the Constitution) should govern their creations—the local, state and federal governments. Thus, for all practical purposes, the immediate authors of the laws that provided the “limits” in “limited government” are the people. The people’s laws are expressed in the Constitution. The limits in limited government are found in the people’s law—the Constitution. As government grows, it increasingly violates the concept of “limited government” and thereby violates the people’s law—the Constitution—which was adopted for the fundamental purpose of limiting the power and size of government. Again, what do you see with your own eyes? Does big and growing government seem increasingly unconstitutional? Does big and growing government seem increasingly lawless. • Contrary to Minority Leader Pelosi’s complaint, the Tea Party members of the Republican Party still believe in some government. But, unlike Pelosi and the Democrat Party leadership, they don’t believe in unlimited (lawless) government. Pelosi’s description is amazingly correct. I’m surprised that she let the cat out of the bag. This battle about Obamacare and government shutdown is not a simple matter of political theater. It’s fare more than He said; She said. It’s far more than a debate about President Obama’s “signature legislation”. Instead, just as Pelosi admitted, it’s really about the “extent of government”. It’s about whether we will have big, bigger and finally biggest government—or if we should we return to the limited government intended by the Founders. Insofar as this controversy is really about the “extent of government” it’s a watershed event that goes much deeper than mere “Obamacare”. It’s unlikely that the Tea Party Republicans will win. They might postpone Obamacare, but they won’t kill it at this time. But if they did win to any extent—even by postponing Obamacare’s implementation for another year—this conflict might help end big government for a generation or more. If the Democrats win, big government will persist a while longer and move us closer to unlimited (overtly criminal/unconstitutional/dictatorial) government. But even if the Democrats win today, the Tea Party Republicans have fired a “shot heard round the world”. Even if the Obamacare/Government-shutdown controversy does not mark the end of big government right now, it may nevertheless mark the beginning of that end. It may well be that government has finally spent too much, supported too many special interests, violated too many constitutional limits, gone too deeply into debt, and committed too many crimes. The Tea Party, at least, seems to have had enough. So, there’s a very good chance that the Tea Party’s resistance to Obamacare is not an isolated event. It may be that the Tea Party is ascending while the collectivist, big-government Democrats (and “Republicrats”) are in retreat. • Ultimately, it has to be that way. 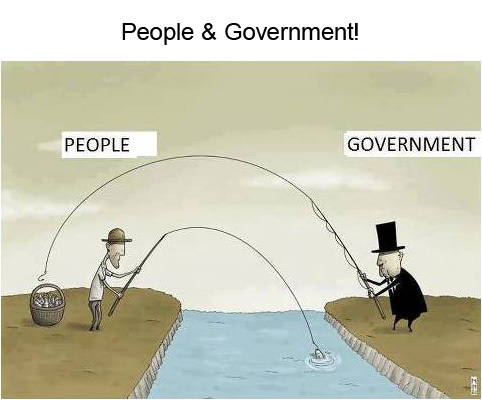 Instead, the gangsters that comprise big government must pull in their horns because government is so deep in debt that it can’t go much deeper. We’re reaching the moment when government will be forced to overtly default on its debts or, at least, covertly diminish its debts with hyperinflation. Regardless of ideology, government is too broke to get bigger. They’ve crippled the economy and reduced tax revenues and nearly destroyed the US government credit rating and ability to borrow. Thus, even if big government can’t be stopped with moral arguments, it will be stopped by financial realities. Big government can’t grow bigger without more “easy money” to bribe the people. Therefore, government may soon be forced by its own debts to grow smaller. • America’s revolutionary rejection of big government isn’t confined to Congress. A growing number of State legislatures have joined this revolution by proposing and sometimes passing State laws which mandate that their state government ignore and defy certain federal laws. Like the Tea Party Republicans, even state legislatures are trying to “limit” big, seemingly-unlimited federal government with state laws. Guns: If there’s one subject that makes people despise and defy the Feds’ lust for more power, it’s gun control.Texas proposed making it a felony to enforce federal gun control laws. Washington fines federal enforcement agents, Michigan protects local gun makers from the Feds, and Oregon proposed a refusal to enforce presidential executive orders. States across the country are defending the right to keep and bear arms against federal meddling and are thereby imposing new limits on federal power. If the feds won’t obey the Constitution, perhaps they’ll obey state laws. Currency: Fearing collapse of the US dollar, Virginia has advocated issuing its own state currency. Texas, Louisiana, and Idaho have passed laws that recognize gold and silver as monetary instruments. Anti-NDAA: The “Washington State Preservation of Liberty Act” denies the dictatorial powers given the President by the National Defense Authorization Act. California recently passed a law that mandates that at least some elements of the NDAA (indefinite detention by US military) be defied. Obamacare: Idaho (and other states) have attempted to nullify Obamacare with state legislation. These attempts have, so far, failed. But the number of attempts is more evidence of a revolutionary, anti-big-government sentiment that’s growing in the body politic. Nullification: Mississippi proposed legislation to create a state committee to nullify federal laws that the state doesn’t want to follow. South Carolina considered similar legislation to nullify "gun control, health-care reform, and the detention of suspected terrorists." Marijuana: Washington and Colorado have legalized the use of marijuana. President Obama has refused to challenge those state laws saying, “We have bigger fish to fry.” Indeed, the Feds do have bigger fish to fry—but they’re also too broke to buy more Crisco. They are therefore assenting to state laws that reduce the powers of big, federal government. These state attempts to defy and limit federal powers are absolute evidence that a revolution is taking place, right now. This revolution hasn’t won, but it’s growing. The American people are increasingly fed up with the Feds’ power-grabs. Given that government is going broke and will no longer be able to bribe Americans with “benefits,” loyalty to the Feds is going to fall hard. • Again, my point: the Obamacare/government-shutdown debate is not just another instance of political theater. Indeed, it’s evidence there is a revolution brewing right now in Congress and in the American body politic. This is no game—a profound, government-shaking change has begun and it’s challenging the “extent of government”. This is big-time, winner-take-all, revolution that just might mark the beginning of the end of Franklin D. Roosevelt’s “New Deal”. Thus, the Obamacare/Government-shutdown is far more important than most people suppose. It’s huge. We should all be excited by the struggle that’s become manifest in Congress. • I hope the Tea Party and the Republicans stick to their guns and refuse to allow government to reopen unless Obamacare is at least postponed. If doing so helps to restores limits on government’s size and power, the initial result may be painful as we lose the “benefit” of government’s economic “stimulus”. But, financial realities will eventually cause that loss, anyway—no matter what. More, the result of a diminished federal government will eventually be a blessing as we also lose the liability of feeding (and over-feeding) big government gangsters. Without the federal government constantly predating upon us, we might regain our optimism and even prosperity. If you agree, and if you’d like to support the revolution against big government, now’s the time to call or write to your Republican and Tea Party representatives. Tell them that you understand that they’re waging a revolutionary revolt against big government. Tell ‘em that you support that revolution. Encourage them to stand their ground—not against Obamacare or for a government shutdown—but for limited, constitutional and lawful government. Here is the bottom line for some of you slow 50-yard line thinkers. The Progressive Democrats and establishment Republicans directly caused the Government shut down because they were not willing to negotiate with the House at all. The House was willing to talk delays with the Senate and Obama instead of only defunding but the negotiation door was slammed shut. No talk — no delay…all Obama’s way or nothing. Obama and the progressives in the Senate continue their blame fest and disinformation campaign. Obama screams with his dictatorship tonsils that he will VETO all ‘piecemeal’ appropriation bills that the House is now putting together to keep Government essentials going. Notice that it is the House working on Sundays not the Senate to try and keep things going. It is the House putting together small and quick bills to fund national parks, National Institutes of Health and to pay the National Guard and military reserves. In response, Obama promises to VETO every funding bill the House passes to him. All because the Narcissist n’ Chief isn’t getting his supreme way with Obamacare. Obama and the Senate know Obamacare is an unaffordable failure only causing harm to the nation. That is exactly what Obama intended to do – cause harm to our nation and force the desperate masses to his one payer system – the final control dragon. The sad truth is that the Democrat progressives and Republican establishment in the Senate live in an UN Constitutional playground. According to our Constitution, 2 Senators from each state are to be representing the states wishes and desires, not their party or Presidents wants. Instead of representing the people’s interests, the Senate is seemingly stuck on ‘happy hour stupid’ following only their progressive/Obama agenda. Most states and most polls (dozens of them) – everything from Fox news to USA today and NBC news reveal essentially the same thing. Though the numbers are subtly different, they all point to the majority of Americans – all kinds of Americans not in favor of Obamacare. How is it then that the Senate doesn’t boldly represent their state’s wishes and fight this bill to the death? It shouldn’t matter at all where the Bill came from — Democrat or Republican. It is Unconstitutional, forces the people to buy Government approved insurance against their will, is unaffordable and compromises our nations health care. Any questions? The Senate is only serving their ‘lord and savior’ Obama. Long ago most Democrats and some establishment Republicans transformed from elected political officials to Obama owned whores. We must continue massive pressure with faxes, emails and phone calls to the House and Senate. Don’t stop now! Keep demanding that our elected leaders in the House and Senate STOP OBAMACARE NOW. What does angina heart disease, Bob Dole and erectile dysfunction all have in common? The answer is a little blue pill netting $2 billion in sales called Viagra. A mountain of marketing has been created for this substance called sildenafil citrate, which was originally designed twenty-four years ago to treat coronary heart disease (angina and blood pressure). Viagra sales net 45% of the market and second place goes to a drug called Cialis. There is significant risk that comes with using these drugs. Let's be informed and see if there is something else and less risky that you can use. In the late 1980's, the drug known as Viagra failed miserably in the treatment of coronary heart disease. Researcher, Ian Osterloh of Pfizer, compiled the evidence and noticed that male participants said they had an increase in erections a few days after taking the drug. It was strange that a drug could enhance blood vessel function in the genital area but not the heart. By the 1990's Viagra was fast tracked to be "the drug in every American bedroom." Drug companies pushed to replace testosterone with a blue pill known as Viagra. In the 1990's there was still a stigma attached to ED and men and their sexual partner didn't like to talk about it. If you don't talk to your doctor about it, how can he convince you to take the blue pills? To break the ice the drug company Pfizer hired politician Bob Dole to heighten public awareness to the male impotence problem. The CIA is said to have used Viagra pills as bargaining chips in dealing with the Taliban insurgency. By 1998, 40,000 men filled their Viagra prescriptions hoping to leave erectile dysfunction in the dust. The first year Viagra was marketed to the public as the solution to male impotence, over 500 men died using the drug. In 2000, researcher Dr. Danjay Kaul brought to the attention of the American College of Cardiology, the cardiovascular events most likely associated with the use of Viagra. However, they didn't want to officially state that Viagra was the underlying cause of the heart attacks and death. Dr. Kaul put it this way, "Our data appear to suggest that there are a relatively high number of deaths and adverse cardiovascular events associated with the use of Viagra." Researchers at Cedars-Sinai Medical Center in LA reported in 2000 that they had 1,473 adverse events involving Viagra. That is just one US hospital. According to the research, a 50 mg dose of Viagra can cause health risks within 4-5 hours and a majority of the risk occurred in men younger than 65-years-of-age. So, the adverse events and deaths as a result of using drugs that treat ED are underreported. Drug task force agents in Athens, Georgia report that they routinely find college-age men in possession of Viagra and don't have a prescription for it. Viagra is often misused as a party drug. A study done by the San Francisco, California Department of Health in 2002 reported that homosexual and bisexual males were four times more likely than heterosexual men to use Viagra. Within a year of Viagra being released to the market, it went from a household name to a street drug. Free samples of the drug were given to physicians and the blue pills were given out like trick-or-treat candy. Men in possession of the samples shared them with friends having no knowledge of their health condition or if they were taking other prescription drugs. By 2002, there were over 23 million men using Viagra. As if Viagra were not enough risk for men with ED, in 2003 the FDA approves Bayer's Levitra and Lilly's Cialis for the market. The side effects of Cialis were similar to Viagra's but this time doctors warned men with heart or blood pressure problems not to use the drug. In 2012, yet another drug for ED called Stendra was released. If you live in Germany the insurance companies pay for the ED drugs. As I mentioned, younger men are using male impotence drugs as recreational-type drugs. This drug is dangerous no matter how old men are. Take for example this 25-year-old male from Yemein who took five (5) Viagra pills or 125 mg (doctors prescribe 25 mg to 100 mg per dose) on his wedding day and collapsed at the reception. He died at the hospital. Maintenance is a necessary reality whether you are talking about your car, furnace or your own body. You will want to use common sense and use natural therapies to reduce the health risks as you get older. Eating whole organic foods, drinking more clean water and get regular exercise; those are the basics. Using prevention-type natural therapies will help cleanse away toxins and build immune system to also help reduce health risks and prevent physical dysfunction. We can reference empirical history where specific herbs have helped men to balance their reproductive system for better function. Herbs such as; sarsaparilla, saw palmetto, cardamom, thuja leaf, ginseng and gingko are just a few. You can learn how to use these herbs to cleanse the prostate, reduce inflammation and help the body make the right amount of hormones and improve circulation without the risk of adverse events. If you'd like to learn more about how you can reduce the risk of male impotence and protect your prostate, then call the folks at Apothecary Herbs to ask about their herbal Male Hormone formula and Prostate Kit. Call toll free to order or for your free product catalog 866-229-3663, International 704-885-0277 or online http://www.thepowerherbs.com/herbs/Herbs-For-Men.html, where your healthcare options just became endless. MORE HERB SECRETS IN THE POWER HERBS e-BOOK. By popular demand The Power Herbs e-book is available with symptom/herb reference guide, information on organ cleansing and how to make your own herbal tinctures plus a whole lot more. On my show on 9/28/13, I discussed the work of (now deceased) Dr. Boyd Graves, who documented that HIV was created by the mad scientists here in the US as part of the Special Virus Cancer Program (SVCP) which was funded by the US government between 1962-1978. You can listen to the archive of that show at http://thelightofdayradioshow.com/archives/RBN-BACKUP/commercialFree.html. (In the 2nd half of the show, caller Werner Bock (Canadian cattle farmer whose cattle have been killed and mutilated for years) gave an update on his persecution for continuing to press for answers, and caller Bill discussed how disinformers on RBN are now having guests on who claim that the Federal Reserve is NOT a private Bank; one host, Deanna Spingola, is doing so despite the fact that a book she wrote has many references explaining how the Federal Reserve IS a private bank). It is mind boggling how many people who started out trying to wake people up as to what is really going on are now selling their souls for cash. This is why I always tell people not to believe anyone, INCLUDING ME. You must check things out for yourself, as we have been lied to about EVERYTHING. This is why I spend so much time in my newsletters giving links you can start with to verify what my research has revealed. Many you tubes of Dr. Boyd Graves can be accessed here. Start with http://www.youtube.com/watch?v=2iktjMlMHKkand http://www.youtube.com/watch?v=2iktjMlMHKk to see Dr. Graves present his flow chart of the 1971 SVCP developing HIV (you can get a copy of this flowchart at http://mikephilbin.blogspot.com/2009/07/aidshiv-activist-dr-boyd-graves-rip.html). Not only did he discover the smoking gun proving that government mad scientists developed HIV as a weapon of depopulation, he also discovered that they had patented the CURE for AIDS called TETRASIL (patent 56769770, composed of silver & oxygen (http://www.scribd.com/doc/17224378/AIDS-CURE-US-Patent-5676977 ). No doubt this is how Magic Johnson was cured of AIDS; of course, he was obviously told never to mention the cure. Dr. Boyd died of mysterious circumstances on 6/18/09 after he had alerted Presidents Clinton & Obama, Senator Feingold and others in government as to what he had documented. This is how it works in the country with the most corrupt government on the face of the planet; this is what you are paying for with your tax dollars (the creation of bioweapons against the people, and the murder of anyone who brings their evil into the light). Having had 3 attempts on my life since I started doing this work 16 years ago, I know it is just a matter of time before I get my reward for speaking the truth. And I will finally go on vacation and get out of this hell on earth, where the majority of the population sticks their heads in the sand and keeps waving their flags, aiding and abetting their own destruction with their silence. Will enough citizens ever choose courage over inaction due to fear that there is nothing that can be done to stop the psychopaths destroying everything that matters? Will they do so before the enslavement and genocide of humanity is a done deal? That depends on each one of YOU. In the meantime, the traitors in the district of criminals have allowed a government "shut down" to commence today, 10/1/13, on the same day that "Obamacare" kicks in. Traitor in chief Obama went on air yesterday to announce that of the 2 million civilian and 1.2 million active duty military who are federal employees, the shutdown will affect approximately 800,000 "non-essential" personnel. Of course, the 1st question that comes to mind is: WHY ARE 800,000 EMPLOYEES PAID BY THE GOVERNMENT IF THEY ARE NON ESSENTIAL? Those non essential employees will now go on furlough; i.e., a forced vacation. Did you know that in prior shutdowns, Congress passed bills to pay them retroactively? That's right; just as occurs when psycho cops murder citizens and are put on paid administrative leave (vacation), the same thing will likely occur with these 800,000. It was mentioned on C Span this morning by one of the talking heads that the COST of the last shutdown 17 years ago was $1.4 BILLION. So, we can multiply that a few times (depending on how long the shutdown lasts). That can be added to the federal debt. And if Congress does not increase the federal debt limit AGAIN by October 17th, the government defaults on its debt (mostly to the Federal Reserve for their usury fee for printing their federal reserve notes). I have mentioned before in my newsletter that both Iceland and Hungary kicked the banksters out of those countries, which is the only way we will ever escape this financial theft of the citizens. Of course, our Congress will never do so, as they are but mere puppets for their controllers. They care only about themselves, as was proven once again when the senate refused to agree to the Vitter amendment, which would have mandated that Congress accept the same Obamacare they are forcing on everyone else. The best thing, in my opinion, that will occur with the government shutdown is that research programs funded by the federal government will have to stop. New patients won't be accepted into clinical research trials funded by the NIH to be used as experimental lab rats. The 1,300 biowarfare labs in the US will have to suspend their creation of bioweapons. If you need help in reversing your disease with natural therapies. please go to http://www.reversingvaccineinduceddiseases.com/servicesto learn how Dr. Carley does consults. (Note that Alzheimers can also be reversed as long as there is family available to give the person their remedies). You can access many archives of internet shows Dr. Carley has done over the last few years at http://thelightofdayradioshow.com/archives/RBN-BACKUP/commercialFree.html .. Dr. Carley's "What's Ailing America?" can now be heard onwww.freedomslips.com, studio B, every Saturday from 6-8 PM EST.